In a nuclear metdown of pop-cultural self-referentiality that should have semiotics boffins at the University of Thamesmead wet-dreaming for months to come, US toy giant Mattel is commemorating 30 years of boldly going with – yes! 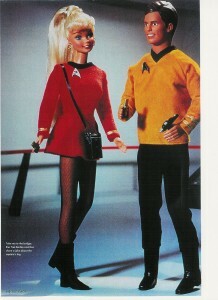 – Star Trek Barbie and Ken. We were pleased to see that Ken and Barbie had shunned The Next Generation in favour of the original Spock ‘n’ Kirk series when it came to choosing their outfits: barb sports a fetching red mini-dress that we have a vague feeling we saw at a Dolce & Gabbana show last year, while Ken has gone for the golden jersey and pants option of a commanding officer. And very commanding he looks too. Trekkies will be excited to hear that Star Trek Barbie and Ken both wear authentic insignia, carry miniature replicas of Communicators and Phasers and – best of all – come in a “commemorative display package” (ie box) picturing them on the bridge of the USS Starship Enterprise. Beam us up, Barbie.